During the presidential campaign, candidate Donald Trump reiterated his desire for a massive infrastructure bill to revitalize America’s crumbling roads, bridges, and airports. President Trump remains committed to infrastructure as a legislative priority, and since most of the GOP-led Congress is skeptical of the idea, Trump will need the support of a substantial number of Democrats to actually get a bill passed. What could a bipartisan infrastructure bill look like? In collaboration with the R Street Institute and the American Conservative, the Washington Monthly hosted an event exploring what President Trump’s infrastructure plan should really look like. The panel discussion built off a piece by Christopher Leinberger — jointly published by the Washington Monthly and the American Conservative — which argues that a smart infrastructure bill should eschew Trump’s indiscriminate approach and instead focus on delivering what the market says Americans actually want: walkable communities. You can read the article here. Jonathan Coppage, moderator, visiting senior fellow in urbanism at the R Street Institute. The complete video of the panel is embedded below. 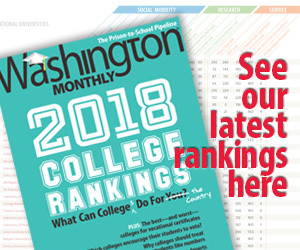 Washington Monthly is on Twitter @washmonthly.